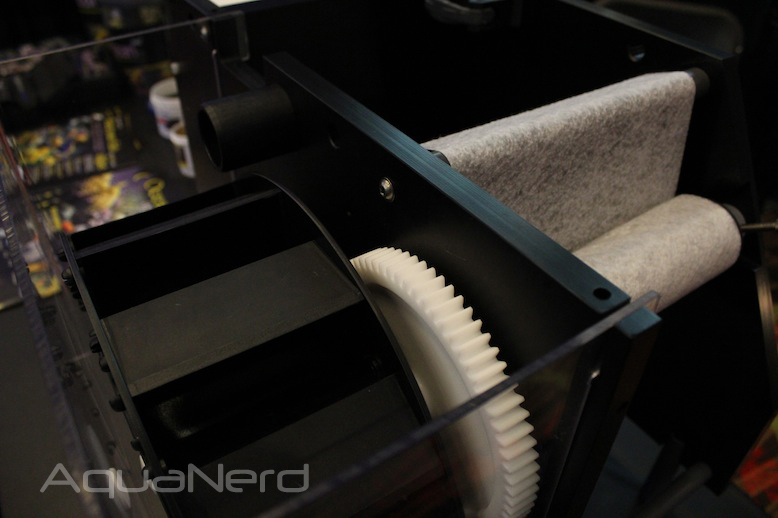 Back in May, we uncovered the E200 PowerRoll Filter, an interesting new conveyor belt looking filtration device from D-D The Aquarium Solution. 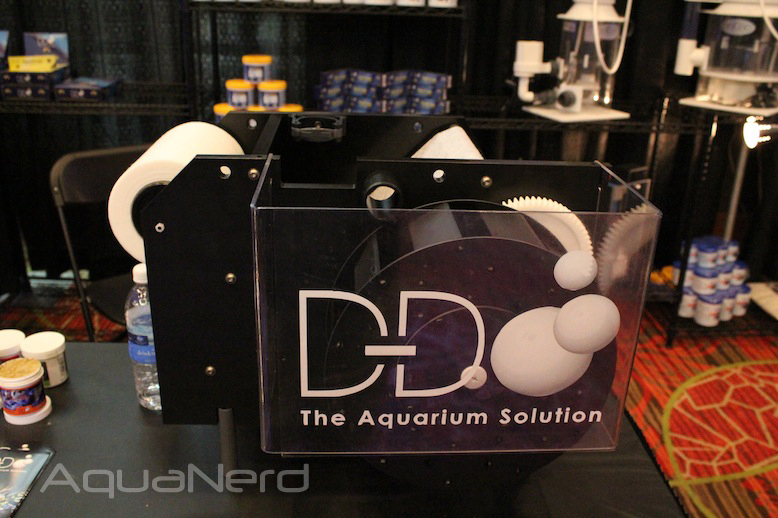 And as with most new aquarium products, D-D was showing it off at MACNA 2012, giving us a better glimpse at how all of its gears and wheels interact. In a nutshell, the E200 PowerRoll operates like a filter sock in that it traps debris on a high density cloth material. Unlike a filter sock, however, the E200 doesn’t fill up and get clogged, requiring replacement. Instead, the filter material is automatically replaced as it rotates through the water. Water enters the PowerRoll essentially as a trickling waterfall over the filter material. As the filter material becomes clogged with debris, the filter chamber fills with water and spills into the adjacent chamber with the paddle wheel. As the water flows over the paddle wheel, inducing rotation, the filter material is pulled ahead so that new filter material is exposed to the incoming water. This causes the water level in the chamber to subside, stopping the flow over the paddle wheel and halting the movement of the filter material. This cycle repeats as the filter becomes clogged, and continues until the filter roll has been used up. The E200 PowerRoll is designed to be used inside of a sump, as water trickles through the device and out the bottom. It does require a great deal of room to use, limiting its use to only the largest of aquariums with ample space under the stand.